Libraries are places where people meet books and their authors. They are often where young people first develop a liking for particular books, and perhaps particular authors. There are many different types of library and the most important for authors who are publishing their own work are: public libraries (for books with general appeal e.g. fiction, children’s illustrated), academic libraries (for books aimed at students or teachers) and legal deposit libraries (who have a right to a free copy of all books published in the UK). More interesting is how you can make libraries your allies when promoting your book. They are directly in touch with the reading public and the professionals and volunteers who work in them are book-loving and book-promoting and on your side. Authors are exotic attractions. Not everyone has written a story, let alone a book. Libraries want to attract families out for a weekend visit by putting on events and other attractions (hot drinks and home-made cakes often feature). So look out for libraries that are holding story-telling events and inviting local authors to take part. You can use the occasion to promote your book and the library will often provide a table for you to sell your books during the event. At Into Print we ship authors’ books into the libraries or direct to the author to provide stock for sale to the public. Libraries are also great spaces for book launches. If you collaborate with your library, it may help with event organisation and invite a local audience – a book club or school depending on your book genre – to add to your own efforts at launch promotion. 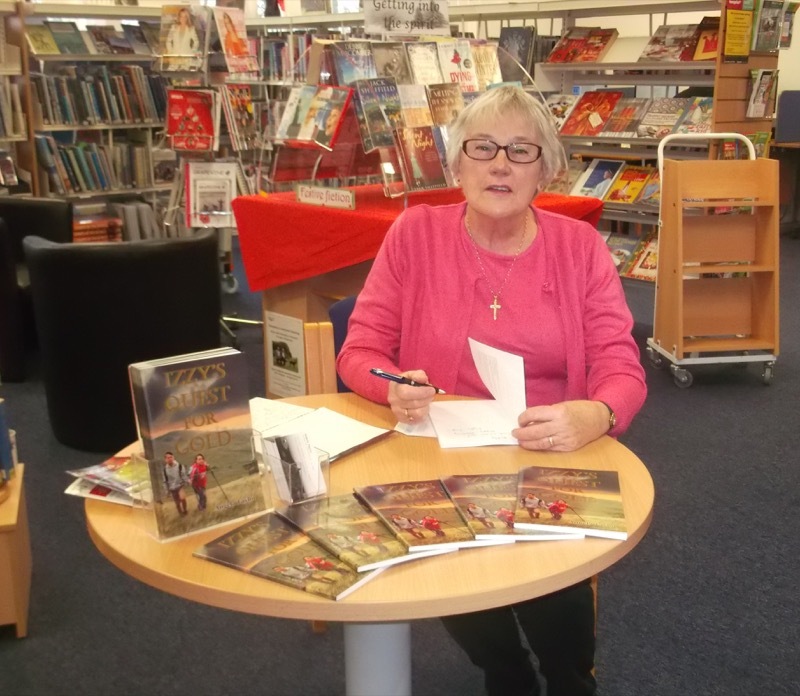 Angela Taylor at a library launch of Izzy’s Quest for Gold. Academic libraries are the allies of authors who have written a student text book or a scholarly work. The academic librarian’s job is to obtain the books that their clients (students and teachers) need to do their work effectively. At Into Print we do our best to assist the librarian by providing as much information about your book as possible. We’ll encourage and help you, as author, to write short and long summaries, and a list of helpful keywords. Timing can also be important so it’s good to use the calendar so that information about your book is in front of the right people at the right time. You may wish to send copies to your contact list in advance of publication so that, on publication, you’ve got academic recommendations and reviews lined up to bolster the credentials of your work. At Into Print we publish in the UK under the Paragon Publishing imprint and so we send a copy of your book to the British Library, and to the other legal deposit libraries on request. We do this on your behalf and at only the cost of doing so i.e. the print cost and the carriage cost. It’s a small amount in the debit column of being in the business of publishing and you get the satisfaction of having your book on public record. So be nice to librarians. They can easily order your book – their databases are supplied with full searchable details. Also, the librarians’ trusted library suppliers are connected to Into Print’s print on demand service. In institutions of learning and in large businesses, librarians source digital versions of your book (also on their databases) and account for any in-house copying of printed works. This copying is enabled by large-scale licensing agreements with collecting agencies. Into Print will connect you to these agencies so that you will benefit from any such use of your work.